In just one mind and body. To feel one moment -- now -- is real. Not of my own making. Schoolyard playfulness of sentient pals. I've switched off self and still come back. Did I fail to read the warning on the box top? At the beginning of the 20th century, one of the biggest problems in physics was to understand the interaction between matter and light. Today we possess an impressively broad and detailed knowledge of matter-light interactions expressed in the language of quantum theory. In 1900, it was generally believed that light was made of waves and that matter was made of particles. This belief was shattered when Albert Einstein (better known for his relativity theories) showed that light in some situations acted like a particle. Einstein's particles of light were christened "photons". Later in the century, Louis de Broglie, the French prince who became a physicist, proposed that particles should possess wave properties. And de Broglie was able to calculate the supposed wavelength of the electron (the lightest of the known particles). He submitted this proposal for his PhD thesis at the Sorbonne. His professors were prepared to reject his thesis on the grounds of preposterousness. But through the intervention of Einstein the prince was awarded his degree which was crowned a few years later by a Nobel Prize when some American physicists at Bell Labs measured the wavelength of the electron which was precisely the value that de Broglie had predicted using his "preposterous" theory. De Broglie's wave theory of matter predicts that every piece of matter possesses frequency, wavelength and "phase" (whatever these quantities might mean). Not only electrons, but protons, cats, bicycles and you yourself possess wave properties. The catch is that the more massive a particle gets, the smaller the particle's de Broglie wavelength. Hence it becomes more difficult to experimentally demonstrate a particle's wave properties as its mass gets larger. Enter the Quantum Olympics. Open only to experimental quantum physics. What is the biggest (most massive) particle whose wave properties you can demonstrate in the laboratory? The electron was the first to show its waviness, later the neutron -- almost 2000 times more massive than the electron -- was shown to be a wave. In the 1990s several large atoms such as Helium, Iodine and Sodium vapors were shown to possess wave properties. And in 1999, someone in Vienna succeeded in diffracting a buckyball -- a soccer-ball-shaped molecule consisting of 60 Carbon atoms. Recently, spectacularly impressive records have been set in the Quantum Olympics. Using a novel matter-wave detection technique developed by John Clauser (of Bell's Theorem fame) called Talbot-Lau interferometry, experimenters from Vienna, Basel and Duisburg-Essen have demonstrated high-contrast quantum interference for a remarkable assortment of complex and increasingly massive molecules culminating with the current winner of Olympic Gold -- molecule "m" shown above. Congratulations to the assortment of clever physicists who showed that this assortment of increasingly massive particles behave like waves as well as like particles. As admirable as these experiments might seem to the ordinary person, they seem even more remarkable, even impossible to the average physicist. These experiments seem impossible on the face of it because wave interference is a very delicate affair, requiring stability and coherence over large times and distances (compared to the sizes of these atoms). 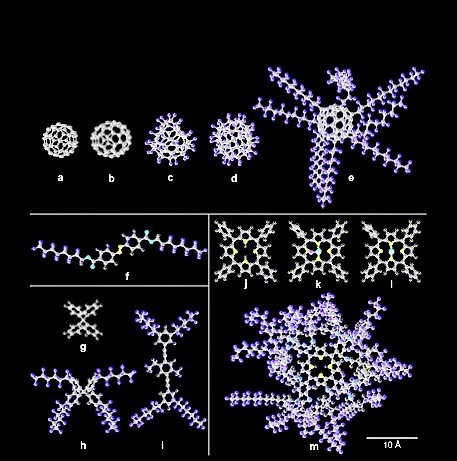 Although it might be possible to observe interference with atoms with very little structure, it should be impossible to do so for buckyballs and especially impossible for the grotesquely complicated molecules pictured above. The reason that such experiments should be impossible is that these complex molecules are not rigid objects but possess hundreds of degrees of rotational, vibrational and conformational freedom. They are turning, vibrating, bending in hundreds of different ways. Certainly the waves associated with such a busy, buzzing, bendable object could never be moving coherently long enough to form a clean high-contrast Talbot Carpet such as the figure above in green. So goes the conventional wisdom. But the conventional wisdom is wrong. It can be shown (by quantum calculations) that as long as the internal motion of the molecule (no matter how grotesque this motion) is UNCORRELATED with the external trajectory of the molecule, then this internal motion will not destroy the coherence of the external motion. Hence these delicate experiments can even be carried out at room temperature when the internal motion of the molecule is as complicated as Times Square on New Year's Eve. However as the temperature is raised and the internal motion becomes hot enough to emit photons, photons that can perturb the molecule's external motion, then coherence is lost and the molecule's wave properties become impossible to detect. This intrinsic decoupling of internal motions from the external motions of a complex object reminds me of a similarly engaging problem in theoretical physics: How do cats always manage to land on their feet when dropped? 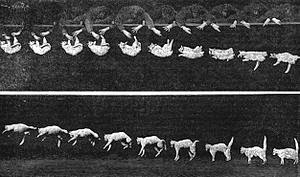 It would seem impossible for a cat to turn over in midair because of conservation of angular momentum. And whatever could the cat push against to begin its spin? Like the busy, buzzing, bendable molecules, a cat's internal motion is completely decoupled from the trajectory of its center of mass. Yet it turns (as Galileo might have said). The cat turns. And lands on its feet. All without violating a single law of physics. Clever cat. Physicist, author, father, explorer. NICK HERBERT is the author of three popular physics books Quantum Reality, Faster Than Light and Elemental Mind. He played a prominent oart in the early Boulder Creek BistroScene poetry movement which resulted in two chapbooks Physics on All Fours and Harlot Nature. Nick was the Fringe Science editor for Berkeley-based Mondo 2000 and in featured in David Jay Brown's Mavericks of the Mind and David Kaiser's How the Hippies Saved Physics.